Advances in early breast cancer detection have come a long way in the past ten years, as the doctors at Independent Imaging will tell you. Dr. Eric Baumel, Dr. Jonathan Huber and Dr. Thomas Kirchner gather around the computer monitor to demonstrate the amazing detail in “breast tomosynthesis,” also known as 3D mammography. (See related article at end of this story about 3D Mammography). 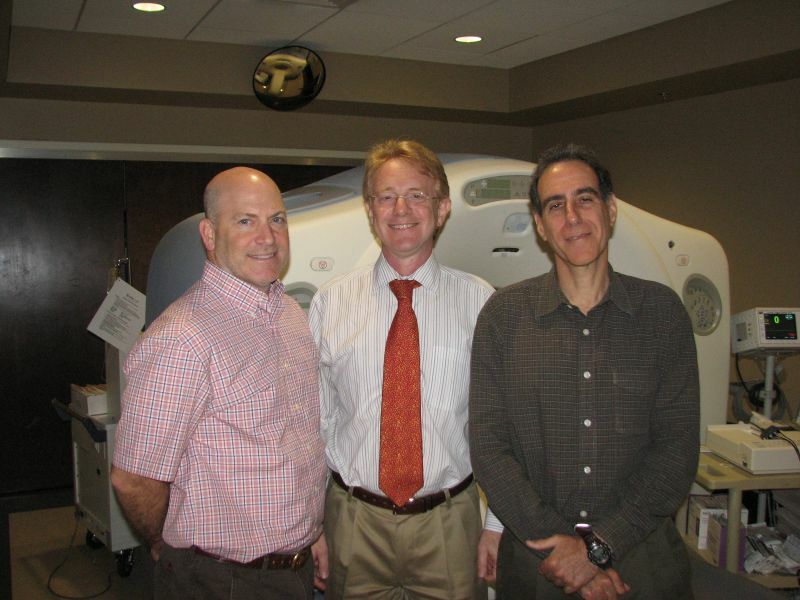 Independent Imaging, located in Palomino Park in Wellington with three other locations, is the only site in the Western Communities offering this level of state-of-the-art radiology, including the tomosynthesis. This is considered “the best of the best” in the industry. “Anything that can help us…and prevent a patient from coming back for additional visits, giving us higher level of confidence with the results is a very good thing,” says Dr. Kirchner, referring to their state-of-the-art technology. “The breast tomosynthesis and 3D mammography,” explains Dr. Huber, “is the only technical advance in decades in this field.” You can clearly see it on their faces – they are excited about this technology, which puts us light years ahead of yesterday’s methods of detection. Dr. Baumel outlines the challenges of radiology with today’s patients. “When you talk about the key to good radiology, it’s basically a ‘Where’s Waldo?’ It’s all about finding the abnormality and putting it in the context of the patient.” This includes knowing the patient’s history, any past or present conditions and understanding the whole context. The three doctors are well-respected in our Wellington area medical community and have all originally worked in the local hospitals. Each doctor has been working in the field of radiology for approximately twenty years, bringing a wealth of expertise to their patients. Dr. Kirchner explains that this helps in two ways – first, it makes the local doctors more likely to call upon them and second, it is a great help that the doctors at Independent Imaging know exactly what is needed (and sometimes needed quickly) for doctor’s offices and patients. CEO of Independent Imaging Dr. Daniel Ghiragossian is proud of the excellent care, beautiful facility and successful results that Independent Imaging brings to patients every day. “The caring quality of our staff is infused in all of them from Day One. If you treat everyone like you would treat your mother (or grandmother), you cannot go wrong.” He constantly reminds his staff that when a patient is coming in for testing, he or she is probably nervous about it. As they refer to him at Independent Imaging, “Dr. G” stresses that each staff member needs to have “the most respect for their patient’s condition” every time. Independent Imaging has been in business since 2001, and Dr. G has been CEO since 2008, when they merged with another radiology practice. The group has grown a lot, especially in the past five years. The partners all saw a need for a different sort of radiology clinic, where a patient could visit one site and take care of ANY diagnostic need in a one-stop shop. This would prevent going to many different clinics and having miscommunications among different doctors too. Extremely quick results. Two to four hours later – same day, and sometimes even faster. What steps do they take at Independent Imaging to put a patient at ease, someone who might be afraid to go for an MRI or another type of test? “There is nothing that we won’t do to make sure that the patient is comfortable,” explains Dr. G. If the technologist shows appreciation for the patients and what they are going through, they are able to get the testing done and work with the anxiety at hand, he says. Also, keeping the process quick and efficient is also a great help to the potentially anxious patient. At Independent Imaging, they pride themselves on having a wonderful staff, and each new staff person is introduced to a high-level of caring for patients. Dr. G explains that the staff might come from a variety of different industries. No matter where they are coming from, the most important thing is to be caring and respectful, according to Dr. G. “If they are not, they do not belong in this company.” They have received many letters of appreciation regarding how good, caring and patient the staff members are. “I will never ask them to rush during their time with the patients,” he adds. “Customer service is the core of what we do here,” says Staci Martin, Marketing & Development Manager for Independent Imaging. Dr. G likes to remind his staff, “You are my voice, my words, my actions.” So from the person who greets patients at the front desk to the technician who reads the data, they are representing Dr. G. and being ambassadors of good service for Independent Imaging. They have approximately 135 staff members with four locations, as well as a call center in the PiersonPark area of Wellington. Independent Imaging locations are in Wellington, in Lake Worth (near the JFK hospital), in Palm BeachGardens and in Belle Glade. Dr. G compares health care to “choosing a restaurant” or “choosing a car” for the sake of analogy. When choosing the best place, why wouldn’t you go to the place with the highest quality, fastest results and best technology? This is what he believes Independent Imaging has to offer, the best of the best. October is Breast Cancer Awareness Month! 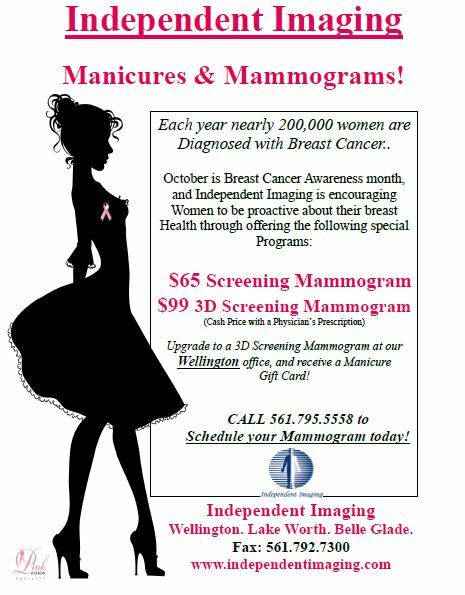 In the month of October, Independent Imaging will be encouraging more women to come in and get high quality mammograms by offering their popular “Manicures & Mammograms” program. Anyone who upgrades (in October) to the 3D Mammography will get a gift certificate to a manicure at Sanda Gane European Day Spa in Wellington. Making Strides Against Breast Cancer! Independent Imaging plans to have a large team to walk in the October 19th event “Making Strides Against Breast Cancer” event along Flagler in West Palm Beach. Independent Imaging in Wellington is excited to be a “hub” for the event, where people can leave their cars and take free transportation to downtown West Palm Beach. For “Around Wellington” residents, this is a great convenience because there is always a lot of traffic getting to the event and parking in downtown West Palm Beach. “We want to promote early detection in our community,” says Staci Martin. 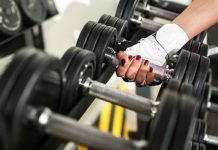 For the month of October only (Breast Cancer Awareness Month), they will offer “very discounted cash pricing” especially beneficial to those who do not have insurance. It will be just $65 for a mammogram screening and $99 for a 3D mammogram with tomosynthesis (see article below). Women without insurance should take advantage of this offer and get checked in October! Breast tomosynthesis, also known as 3D mammography was approved by the FDA on February 11, 2011. Breast tomosynthesis minimizes the effect of overlapping breast tissue by having the X-ray tube and detector moving in tandem, acquiring the images at different angles. These images are then combined to create a three dimensional picture that can be manipulated by the radiologist when reviewing the mammograms. At the current time, the tomosynthesis images are acquired at the same time as the conventional 2D mammograms. Using conventional mammography, about 10 – 15% of women are called back for additional imaging. Tomosynthesis reduces the need for many of these call backs, because the initial studies with tomosythesis will be free of overlapping structures. Another benefit is the improved imaging in women with mammographically dense breasts, because of the elimination of viewing the overlying tissues above and below the areas of interest. Because of the 3D information included in obtaining the tomosynthesis images, the relative position of a suspicious area in the breast can be more precisely identified in all three planes. A recent large study of tomosynthesis was published online July 30, 2013 in Radiology by Brian M. Haas, M.D. and colleagues, from the Yale University School of Medicine in New Haven, Conn. The addition of tomosynthesis to conventional digital mammography resulted in a 30 percent reduction in the overall recall rate. Lower recall rates help reduce patient anxiety and also reduce costs from additional diagnostic examinations, Dr. Haas said. Tomosynthesis has one significant drawback: a radiation dose approximately double that of digital mammography alone. However, Dr. Haas noted that new technology approved by the U.S. Food and Drug Administration could reduce the dose. 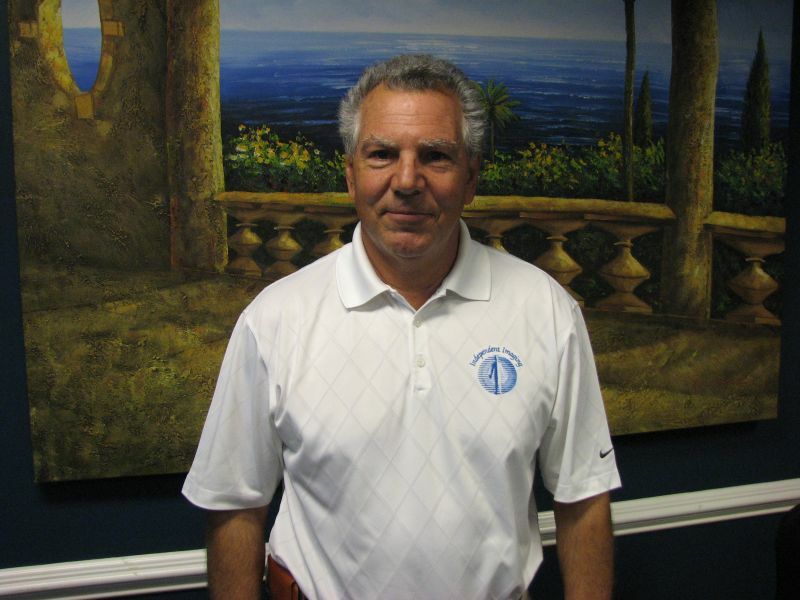 Eric Baumel, MD is the Medical Director at Independent Imaging where 3D Mammography is available. He has also authored an iPhone app called “Radiology Toolbox” (which has been downloaded more than 60,000 times all over the world). 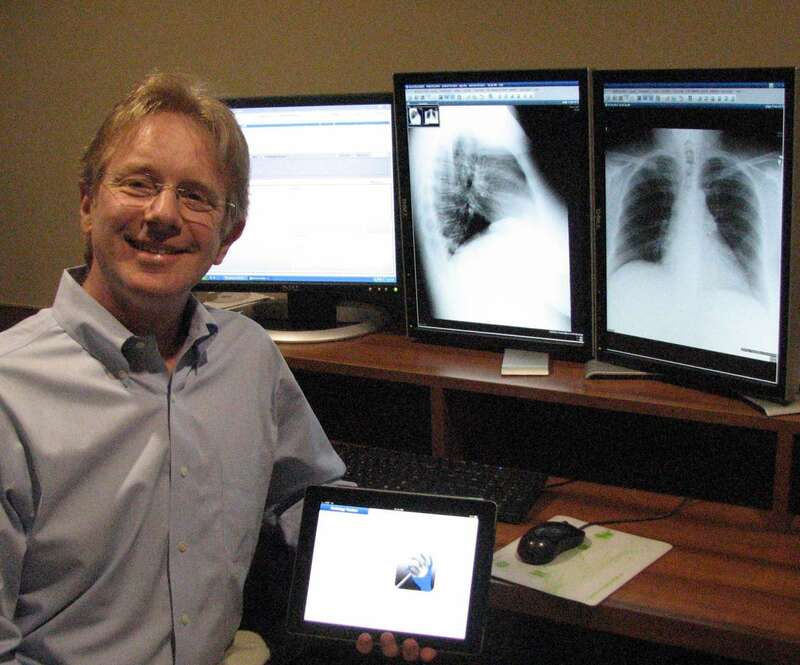 He has recently co-authored an app called “Pediatric Toolbox,” along with Dr. Amy Aqua of Simo & Bruck Pediatrics.